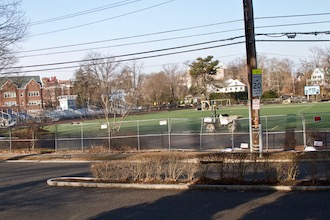 Jan. 23, 2019: Have you driven by Chambers Field at the Bronxville School, noticed the turf pulled up, seen a few workmen around, and wondered what’s going on or where this project stands? The Bronxville School Board of Education provided some answers in its January 17 public meeting. Dan Carlin, assistant superintendent for business of the Bronxville schools, reported that the track and field project is targeted for an April 30 completion. He explained that, based on input from the track community, the new track will go from eight lanes to six lanes on the straightaways and six lanes to four lanes on the curves to make it a 440-yard track. Thus far, the workmen have been focused on drainage, fencing, tree removal, and removal of the batting cage. The turf will be ordered by the end of January and, if all goes well, the project will be completed by the end of April. Carlin explained that weather could be a factor because the ground has to be 38 degrees because of the adhesive needed to install the track. In other facilities news, Carlin reported that he met with a consulting engineer about the September flood event on Meadow Avenue and that they are looking into putting in a pipe from Meadow Avenue to a diversion structure. They will not need to pull up sidewalks or turf to accomplish this project. Carlin also reported that the additional flood mitigation pumps should be coming in April, noting that delivery has been delayed in the past. Rachel Kelly, assistant superintendent of the Bronxville schools, recognized the contributions of nine Bronxville School professionals and one staff member who are taking early retirement this year. Dr. David Katz, history teacher and president of the Bronxville Teachers' Association, further recognized their accomplishments and acknowledged how much they will be missed. Following are the individuals retiring. Finally, Dr. Mara Koetke, director of curriculum and instruction, discussed a new grammar curriculum being piloted in the middle school, and Dr. Montesano, superintendent of the Bronxville schools, discussed work under way by the Academic Integrity Committee to draft a new plagiarism and cheating policy.